The SCOTT SlimrollTM Towel System is a true breakthrough in touchless hard roll technology, proving that good things do come in small, high performance packages! It lets you use a roll towel dispenser in places you didn't think it was possible. Like right next to the sink. Or at a nurses' station where you've never been able to fit a roll towel dispenser before. Sold individually for those that don't need a case, or can't store a case. Individually poly-bagged for moisture protection. 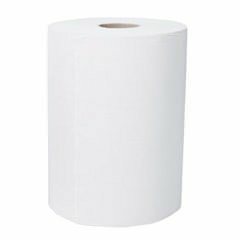 Highly absorbent so you'll use less and waste less. Meets EPA standards; FSC® and EcoLogo® certified. If you have any questions about this product by Sold Individually, contact us by completing and submitting the form below. If you are looking for a specif part number, please include it with your message.